A fire retardant is any substance that, by chemical or physical action, reduces or inhibits combustion, thereby slowing or retarding the rate of spread of the flame front. As the name implies, a distinction should be made between a fire retardant and an agent used to extinguish the flaming and glowing phases of combustion, by direct application on the burning fuel. A firefighting chemical mixture, when applied directly to a fire (usually at the base of the flames), is termed a suppressant because the attempt is made to suppress the flames, not just prevent their spread. The chemical mixture applied ahead of a wildfire front to reduce the rate of fire spread or intensity is termed a fire retardant. Fire retardants are generally broken down into two categories, short-term and long-term. Short-term fire retardant is any substance whose effectiveness relies almost solely on its ability to retain moisture and absorb heat by cooling. Water alone, thickened by any means, or with reduced surface tension additives, is a short-term fire retardant. Additives (foam) to water are essentially water modifiers or thickeners, which permit a thicker layer of water to coat the fuel, thereby increasing the time and energy required to, vaporize the water. Once the water evaporates, any retarding action ends. Short-term fire retardants are usually applied directly to the fire and could easily be termed suppressants. Foam is an example of a short-term retardant. Foam is an aerated solution created by forcing air into, or entraining air in, a water solution containing a foam concentrate by means of suitably designed ground equipment or by cascading it through the air at high velocity (airtanker/performance delivery systems). Foam is a fire suppressant rather than a fire retardant. Foam solutions are often characterized by sets of mutually exclusive terms, although in reality the characteristics are a continuum. A wet foam generally has large bubbles; is fast draining and very fluid. A dry foam is generally made up of smaller, uniform bubbles that drain slowly and will adhere to a vertical surface (These foams are sometimes called stiff or dense). Each one of these foams have similar fire controlling characteristics (methods of fire extinguishment), however, their chemical properties and behaviour with the fuels are dramatically different. For wildfire operations involving wildland fuels, only Class A foams are used. Foams used by wildfire control agencies have been tested and approved to assure that they do not present a hazard to personnel, wildlife or the environment. A long-term fire retardant contains a chemical, which alters the combustion process. The active ingredient, salt, permits pyrolysis at a lower temperature and promotes the formation of H2O, CO2 (water and carbon at once) and char, at the expense of flammable gases. Wood itself does not burn; rather, the gases that are produced through pyrolysis ignite when the "flash point" is reached, and provide the additional heat required to produce additional flammable gases. Other ingredients in the fire retardant formulation provide cooling (e.g. water) and smothering or insulating (e.g. clay/ guar gum) action. Examples of long-term fire retardants are, Fire-Trol¨931, and Phos-Chek¨ LV-R (Table 1). The public, other governmental agencies, environmental groups and FPD personnel are becoming more aware of aerial fire suppression operations. Fire occurrences and subsequent actions in and around populated areas, recreational sites and basic wilderness areas that are available to the public, are increasing every year. In order to minimize problems we must place environmental considerations high in priority in each phase of air operations. Since the location of ATBs provides easy access to the public, care must be taken to prevent spills and contamination of watercourses at or near these ATBs. Evaporation/holding pits or an underground separation tanks are a standard installation at most ATBs that help contain hydrocarbons on site. Environmental protection laws made by governmental agencies must also be followed. Dikes (retaining walls) have to be constructed around fire retardant tanks. These must be large enough to contain all of the volume stored in the fire retardant tanks. Also, berms must be placed around all foam storage tanks. 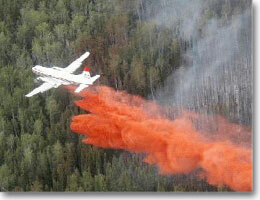 Care is used when applying all retardants either from air or on the ground near any body of water or watercourse.